Based on the Crane Manufacturers Association of America (CMAA) specifications, both single and double girder cranes are equally rigid, strong, and durable. This is because single girder cranes use much stronger cross girders than double girder cranes, and single girder cranes have lateral bracing. However, not all cranes should be designed with a single girder. Single girder cranes have been built in spans of over 100’ and capacities of over 20 tons, but cost-effective engineering dictates that single girder cranes be considered per the chart to the left. 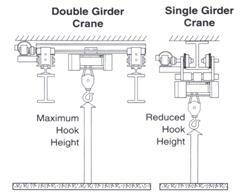 The principle difference between single and double girder cranes is hook height (the distance above the floor that the hook will rise). 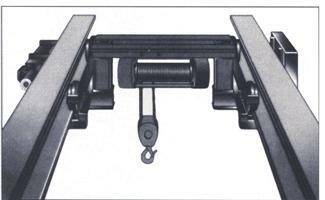 Double girder cranes provide greater hook height, typically 18-36 inches more than single girder cranes. Double girder cranes can provide more lift because the hoist is placed between or on top of the cross girders rather than under them (the trolley can run on top of the girders). Therefore, the depth of the cross girder is gained in switching from a single to a double girder.